Coming from many different backgrounds, Arts Interns bring their unique voices to cultural organizations. Among other things, Arts Interns prepare exhibits, provide content for installations, and build and organize events for the community at large. 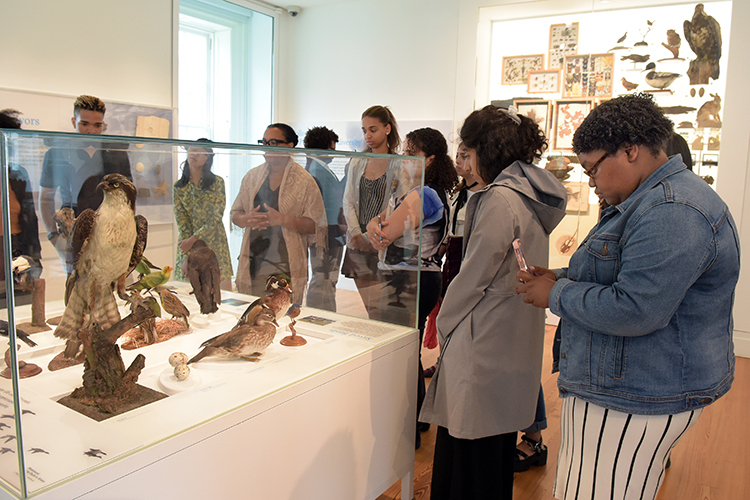 Arts Intern's driving goal is to match skilled college students with paid internships in museums and organizations that make integral places for them on their staff, resulting in valuable career experience. Internships last nine weeks and interns work 28 hours a week. Interns will be paid $15.00 per hour. Arts Interns are employees of their host institution; this means that Interns will be subject to all employment taxes in compliance with local laws. In addition to working in their host institution, Arts Interns must participate in the education component of the program, which is spread out across nine program days throughout the summer. These days will be used to visit other institutions in their city as a cohort, where the Interns will have the opportunity to learn about other jobs in the field. These days will be used to complete program assignments. Upon completion of a final project and confirmation from supervisors that the Intern did not miss any work hours, a final stipend will be paid to each Intern. Please note that, in order to be paid the full amount, students will need to comply with all objectives and requirements of the internship program, including submittal of all weekly paperwork, attendance at museum visits, a mid-summer report, and a final project. Instructions on how to apply are listed at the bottom of each position. 1) Students must be enrolled full time as an undergraduate junior or senior in the Fall following the summer program. This means when you apply, you should be a rising junior or senior, or finishing senior year the following Fall. 2) Students must have an Expected Family Contribution, of less than $5000. This number is on your FAFSA form, to see what it looks like -- click here. 3) Students must meet the residency requirements. These are different for each of Arts Intern's five cities. To view the eligibility requirements, please see the instructions on how to apply at the bottom of each position in each respective city.